January | 2011 | we got us a family here! And one more of Owen. I guess he felt it necessary to wear something girlie to get my attention today. I guess it worked…hence the picture. Me: Hey Owen! I have something really awesome I want to show you! Owen: Oh! What is it? Is it a whip? Me: No, it’s not a whip (I would have been SO cool if I’d pulled out an authentic Indiana Jones whip). It’s something even better! 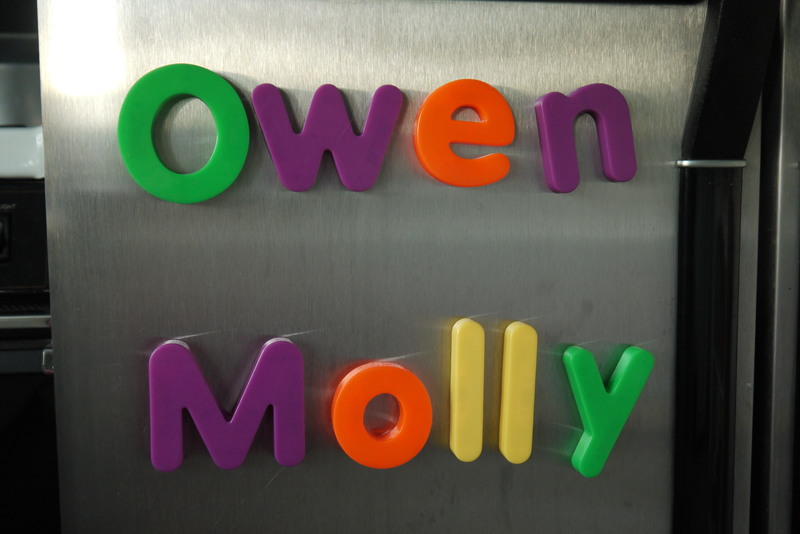 I proceed to take the magnetic letters out of the tub and spell out Owen’s name. Me: Hey O, do you know that these letters spell? Owen: Uhhhhhh (very annoyed with me). I don’t know. Me: Yes you do! This spells out a very important word! Me: Buddy, we’ll have a fight in a little bit. Right now I want you to show me all the great things you’ve learned in school. I know you know this letter. It’s the most important letter of your first name! Owen: FINE. It’s a C.
Me: Um, let’s try again. You know this letter. It also is the shape of a circle. Does that help? Owen: Okay, fine. It’s an L. Can we have a fight now? And this continues as I point out and identify each letter in his name. Each time I ask him to tell me the name of the letter he groans, says either L or C, and then says “When can we fight?”. Finally I give up. Here’s my thought…I have no concerns about his ability to learn. Give the kid any dinosaur and he’ll tell you it’s name and whether it’s a carnivore or herbivore. He will learn his letters. And his numbers. And he will eventually write his name. I could force him to practice these things with me every day and in the process turn him off to working with me and souring him on learning these important things. Instead, I’m just going to keep following his lead. Of course there will be a time when he has to learn these things. But right now, he’s 3. I’ll quiet the teacher in me with the strong desire to have a kid who can’t wait to learn all about reading and instead enjoy the things that my son enjoys. But you better believe these guys will stay on my fridge in hopes that he’ll get curious. Yep. That’s my son’s idea of a good time. And I can’t blame him. 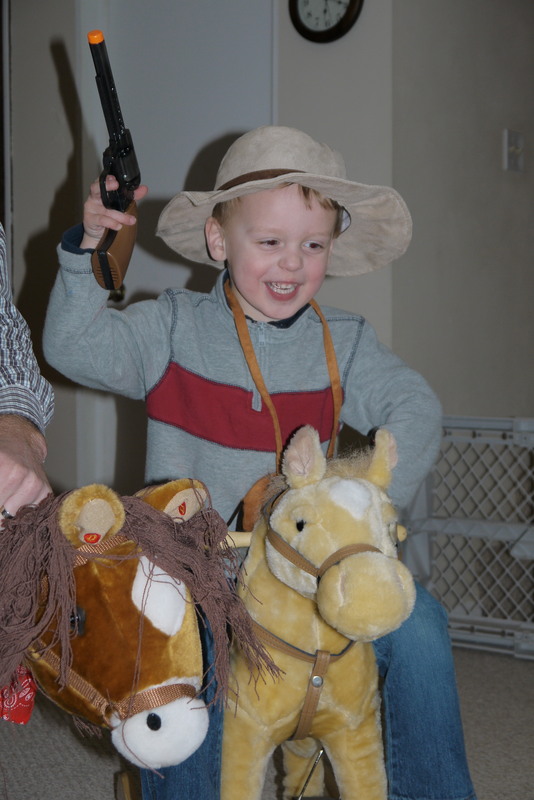 How could he not when he has a dad that comes home from work and immediately picks up his too-small cowboy hat and nerf gun so he can play cowboys with his children while listening cowboy music on CD. Here they are. 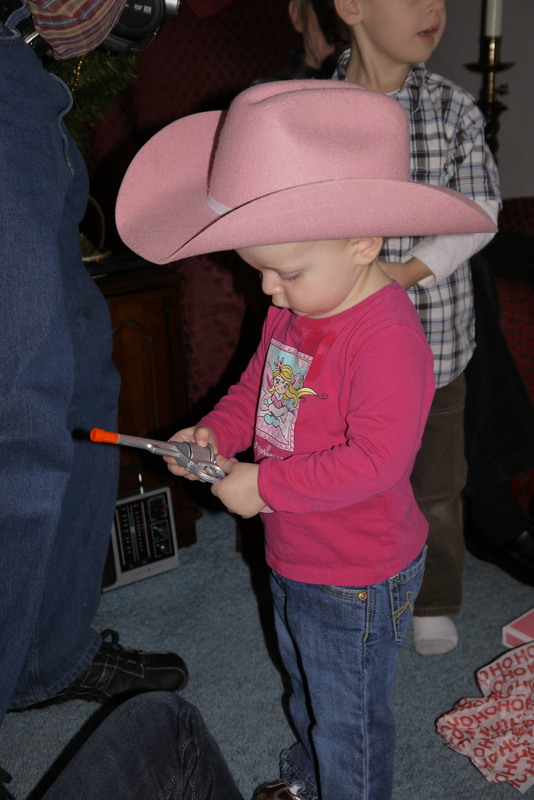 My pacifier-obsessed, mullet-rocking, pink cowboy hat wearing daughter. My wonderful husband who needs there to be music to soundtrack every moment of our lives. And my son. My creative, imaginative, anti-alphabet learning cowboy of a son. 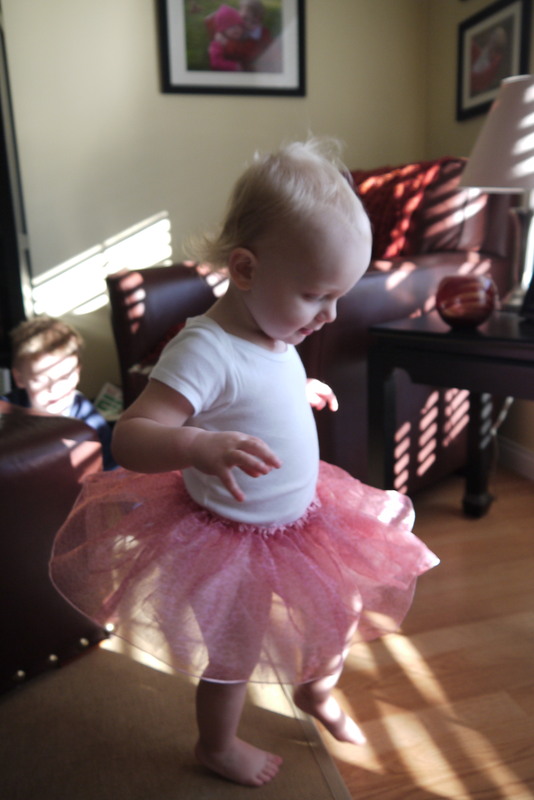 My baby is becoming more and more of a little girl every day. We’re starting to see who Molly is going to be and it’s exciting. She’s starting to have interests which delights me. 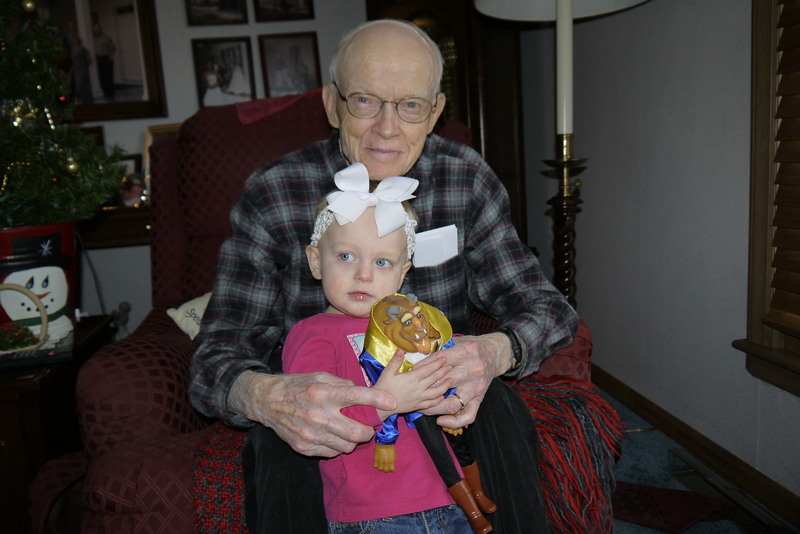 She’s loved baby dolls and princesses for quite some time, but her attention span for these things didn’t last longer than about 30 seconds if I wasn’t right there playing with her. But now she’s discovered puzzles and she LOVES them! I’m not kidding…she’ll work and rework puzzles for about 20 minutes straight. The other day I looked down the basement stairs to check on her and Owen as they were watching a movie. Rather than sitting with her brother on the couch, she’d planted herself next to the stairs surrounded by puzzles. She was contentedly working puzzles, turning them over, and then working them again. I was overjoyed. Seriously. Molly’s a little mover; I often call her my little destroyer. To have found something that she enjoys doing that keeps her busy makes me so happy. Another part of Molly that I love is her sensitivity. She will look through her Bible and point out pictures of people who are hurt or sad and will point and say, “Ohhhh” in a very sympathetic voice. She can sense when people she loves are sad, too, and will give hugs and cuddles. This is just great. I’m just crazy about this little girl. I’ve been reminded so many times these past two weeks of how blessed I am to be her mommy. Owen is becoming more and more independent every day. I really didn’t think I’d ever say that because the words “I can do it myself!” rarely come out of his mouth. He’s more of a “MOMMY! I can’t DO it!” kind of kid. Because of this, I’m proud to say that Owen now goes #1 standing up! For those of you who don’t know Owen or who don’t have kids you are probably thinking, “So what?” or “Is she seriously going to blog about teaching her kid to pee standing up?”. I absolutely am. We knew that taking away his beloved Cars potty seat and teaching him to stand up to pee was going to be devastating…and it was. I’d mentioned in earlier blog posts that teaching him to stand up was a goal over Christmas break. We told him that it was time to be a big boy and learn to go potty without his seat. 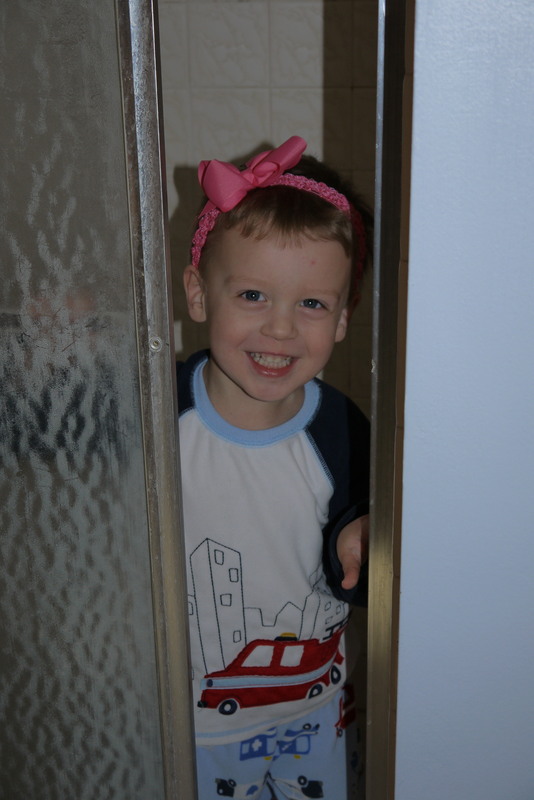 (The driving force behind this was that he was afraid to go to the bathroom anywhere but home because he was afraid to go without his potty seat. That made going to school a bit interesting for Owen.) He knew it was coming and when the potty seat disappeared he was prepared. It took a good week for him to get comfortable going standing up. The first day was rough. 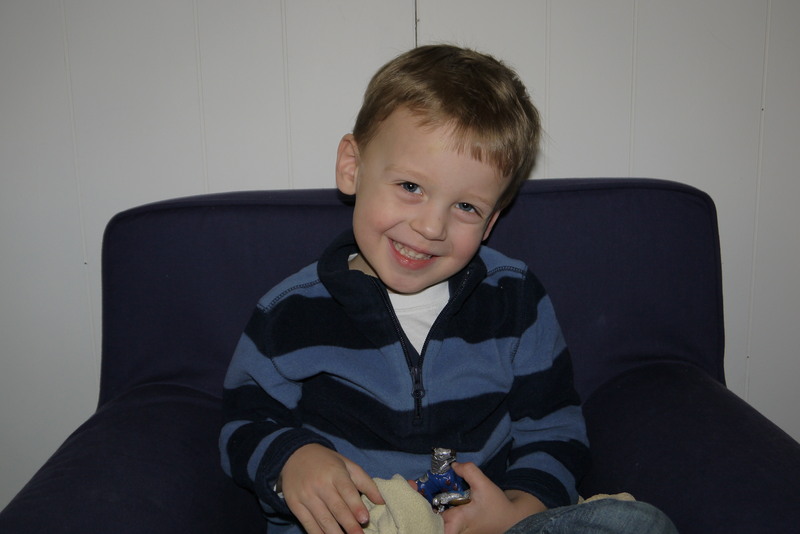 Our deal was this…he could still sit down to pee but he couldn’t use his special potty seat. If he made a mess on the floor he was in charge of cleaning it up and changing his own clothes. It only took one solo clean up for him to want to try to stand. When he finally figured it out, he was excited about it. Teaching to aim was a challenge. I found myself saying things like, “Pretend it’s a gun and you’re shooting at the hole in the toilet.” It’s amazing what you’ll say when you’re REALLY sick of scrubbing the bathroom. We were doing well with standing up to pee. I was pretty pumped. And then it came time for #2. Owen had lots of trouble learning to do this in the potty seat when we were potty training. It was stressful and I will dread potty training another boy if we’re ever blessed with one. I wasn’t anticipating that he’d regress so much when we were simply teaching him to pee standing up. But regress he did. It’s like he has this mental block and can’t comprehend how he can sit down to pee and poop when he has to go #2. He really just won’t do it. The first time the need arose, he flipped out. Completely flipped. Our new deal is this: he can stand up to pee first and then sit down to poop. He can deal with this and so can I. I just wonder how long he’ll need to do this before he gets it through his head that he can sit down to do both. That was probably WAY more info than you wanted about Owen’s newest skill. But for the sake of documentation of my children’s lives…there it is. This newfound independence is being seen in his ability (and sometimes desire) to dress himself. He can dress himself completely…head to toe. It just takes a very long time. While the new independent Owen is great, it reminds me how he’s growing up and learning to not need me quite as much. I know it is part of our job as parents to teach our children independence, but I treasure his bedtime routine where he asks me every night to snuggle with him and to sing the special song. There will come a day when he won’t want me to snuggle and when I ask him if he wants the special song he’ll say no. So I’ll just cherish the ways he still needs me and not wish them away. Each day as this boy’s mommy is a gift. She’s just getting so much of it everywhere except for right on top. 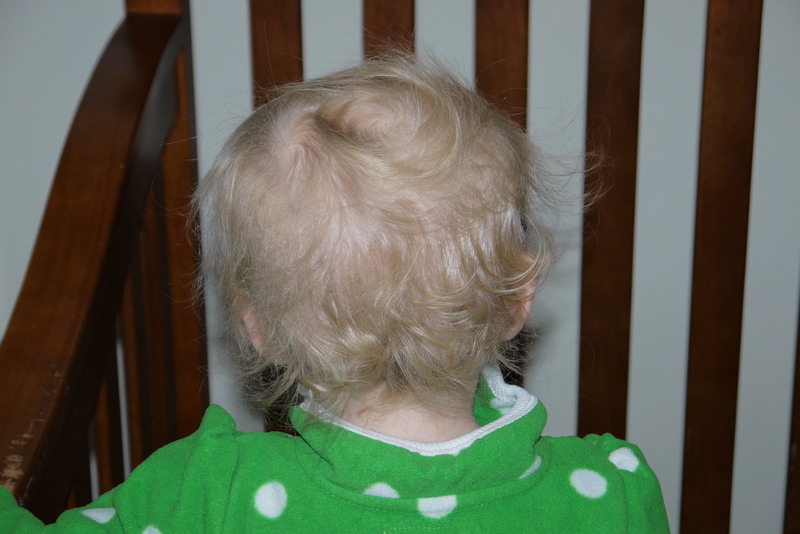 When it all grows in, she’s going to have some beautiful white-blonde curls. But right now it just kind of fuzzes all over the place. 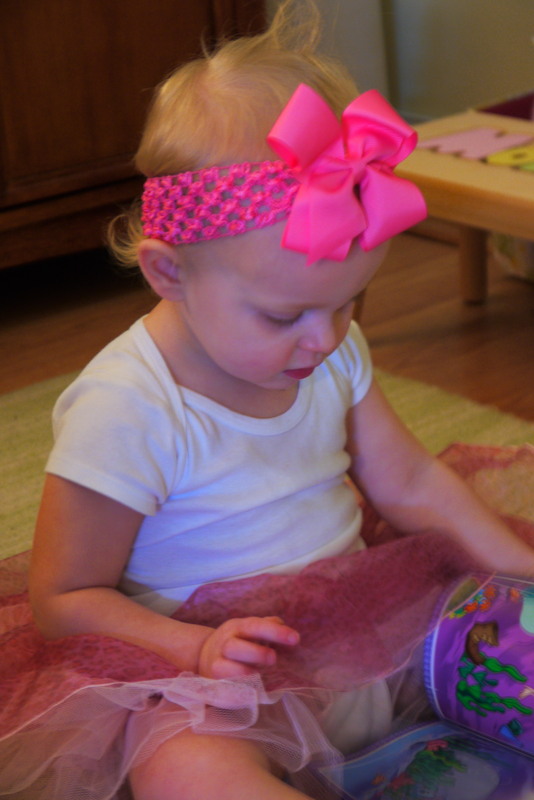 The big bows are quite cute, but for Molly they are a necessity. They hide her mullet. I’m not lying. Bless her heart. 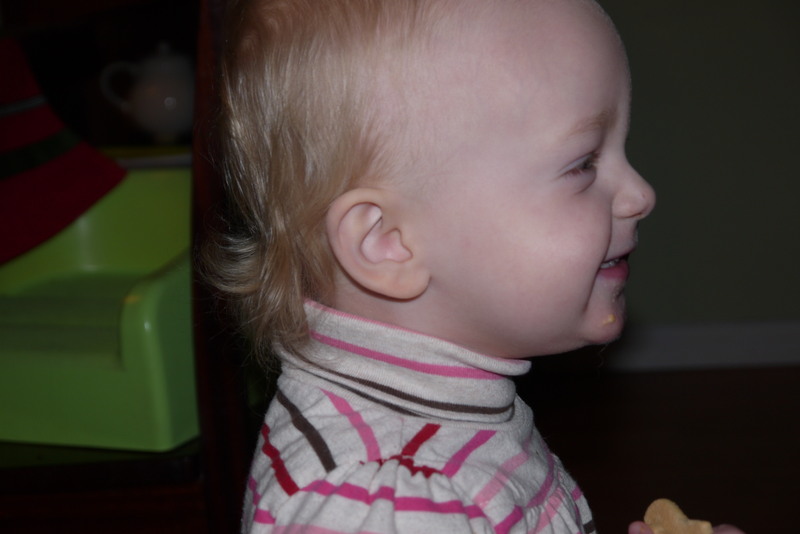 Her sad little mullet is right there, hanging out around her collar. Good thing she’s so unaware when it comes to her hair. Now you know. I’m aware of the hair. 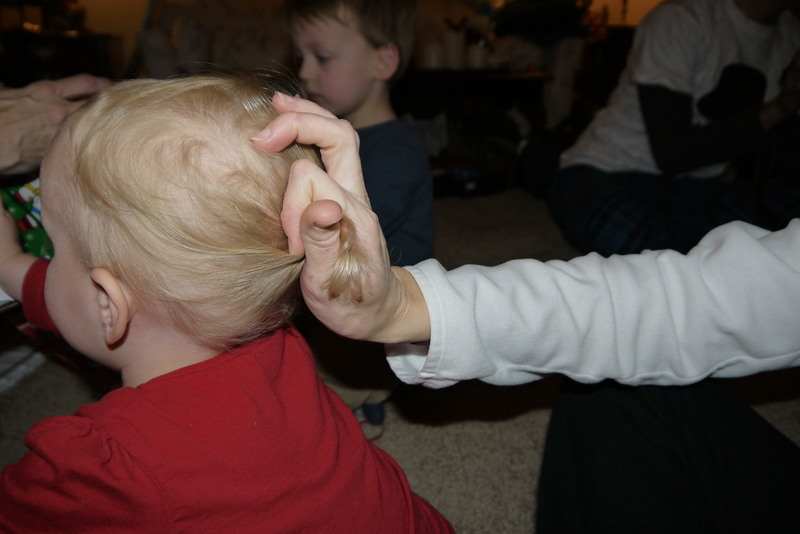 So let’s end on a high note…my pride and joy–the rat tail. What to do? What to do? Cut or let it grow? 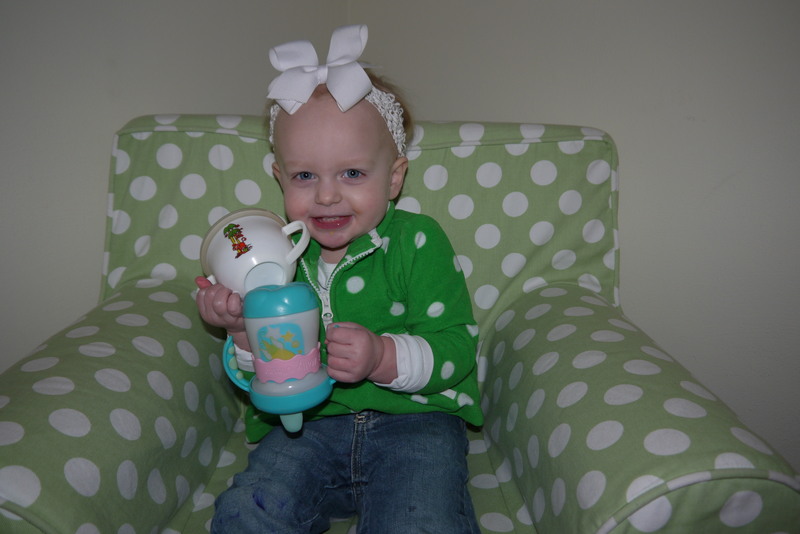 For a baby who’s been bald all her life, cutting the only hair she has seems like cruel and unusual punishment. But maybe allowing her to walk around with a mullet is too?!? I think we’ll keep rockin’ those big bows to disguise the reality we’re facing around here. 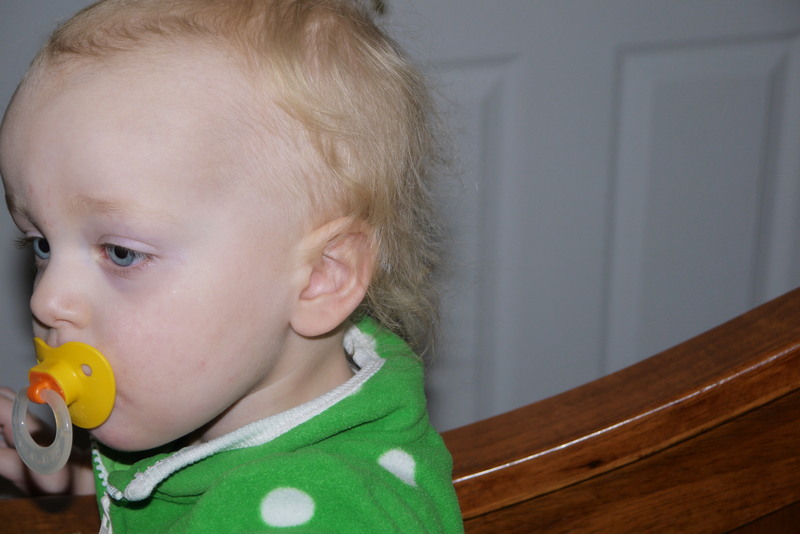 A typical night at our house goes something like this: bathtime, brush teeth, jammies, and then Molly starts loudly chanting, “Owie, Owie, Owie”. I put her down and she runs into his room. He says something like, “Does somebody need a hug?”. She responds with a very demonstrative, “Uh HUH!”. Then they hug. And hug. And hug. I love this. This is my favorite. The day after Christmas we went to Kansas City to celebrate with Trav’s side of the family. 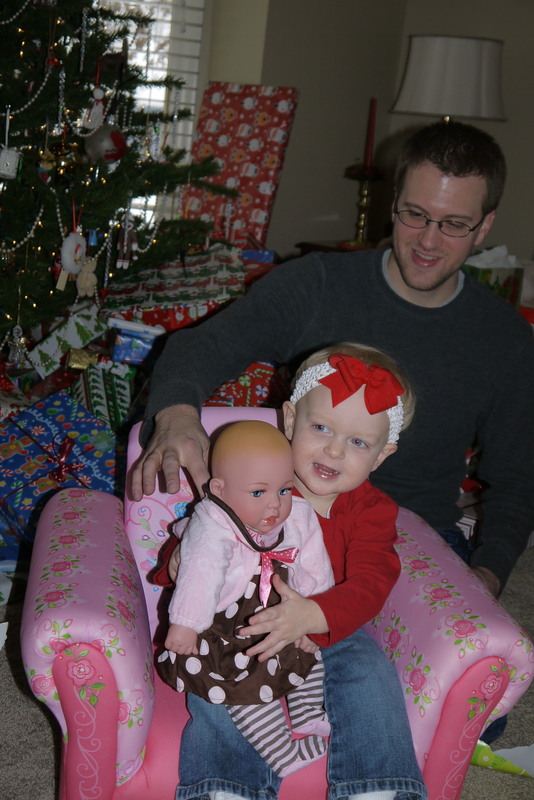 First we went over to his cousin, Casey’s house for our annual Dirty Santa gift exchange. 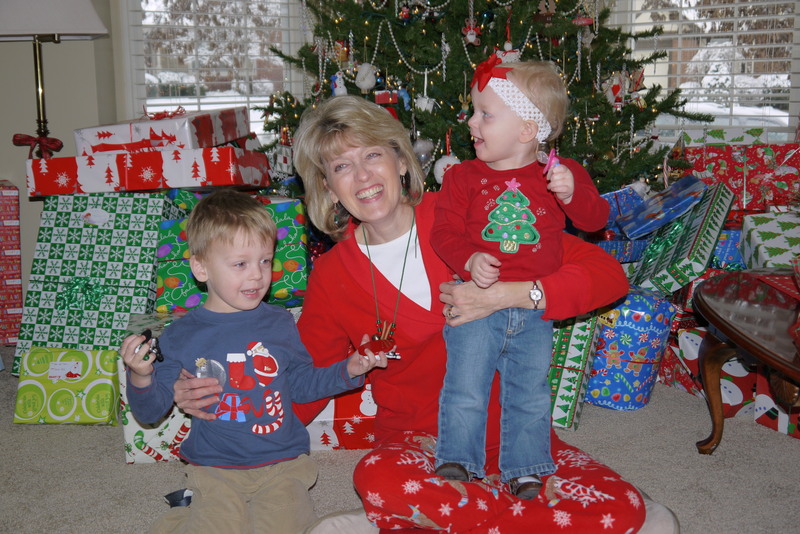 Things were a little crazier this year than they’ve ever been considering there are now 4 kids running around! 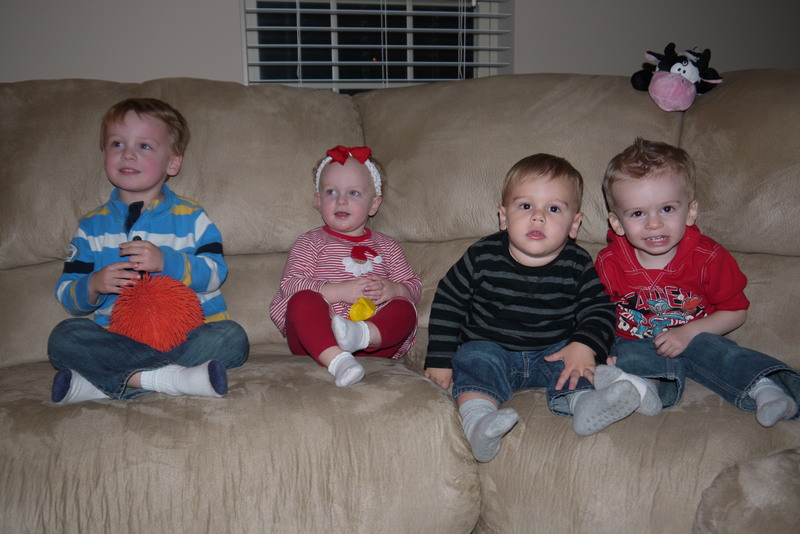 We corralled them for a quick picture (Owen, Molly, Noah–Amy and Luke’s son, and Gavin–Casey and Brad’s son). Molly, Gavin, and Noah are all within 3 months apart. Owen is much more cooperative for pictures lately. 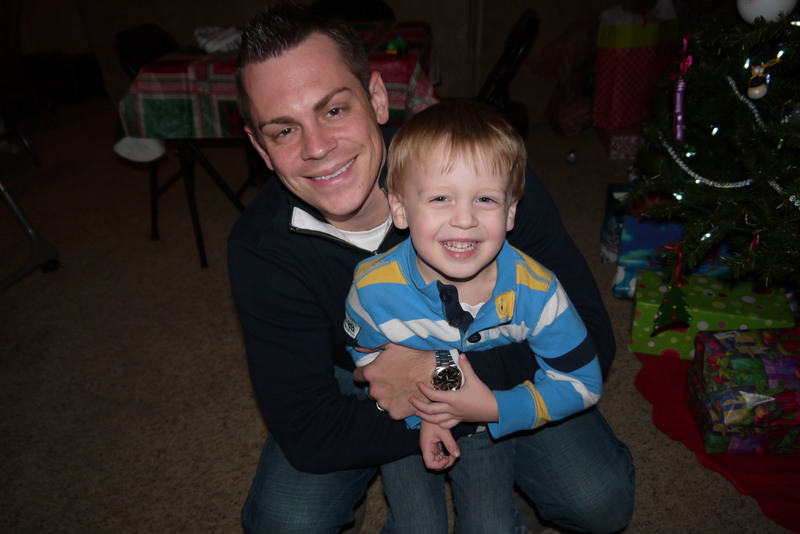 Here he is with Trav’s cousin, Luke. 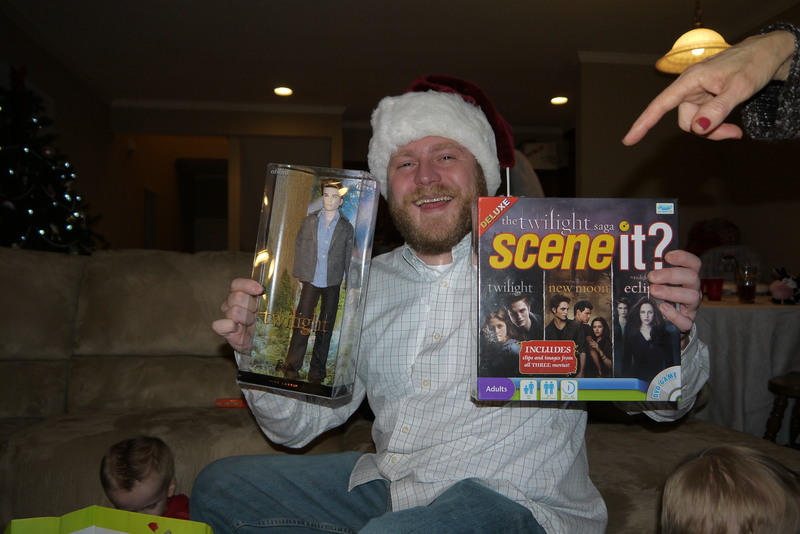 A highlight from our Dirty Santa game was when Trav’s cousin, Don, opened up the Twilight gift. It was quickly stolen away by Amy but it still gave us a good laugh thinking about Don taking home the Edward doll! And Molly was thrilled when she opened up the Beast. I didn’t really want the kids to have play guns until I realized that Owen will create guns out of anything…sticks, blocks, forks. 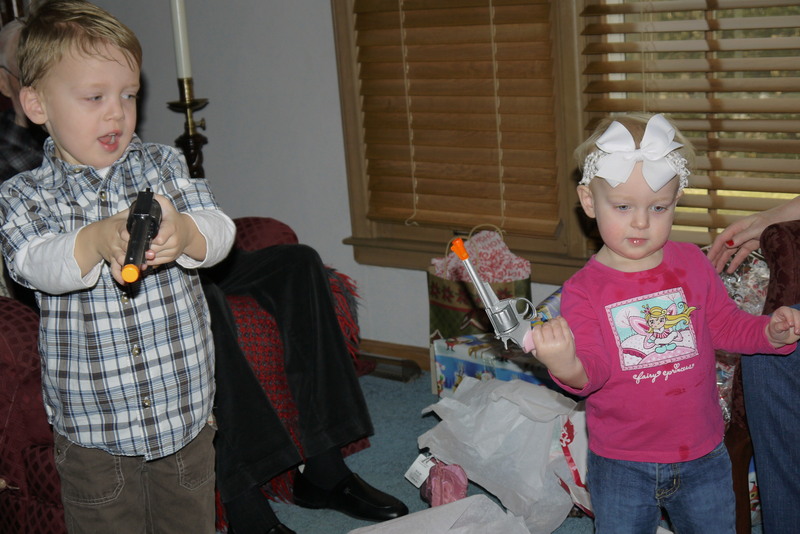 And Molly will do whatever her brother does so she’s now the proud owner of a girly pink gun. 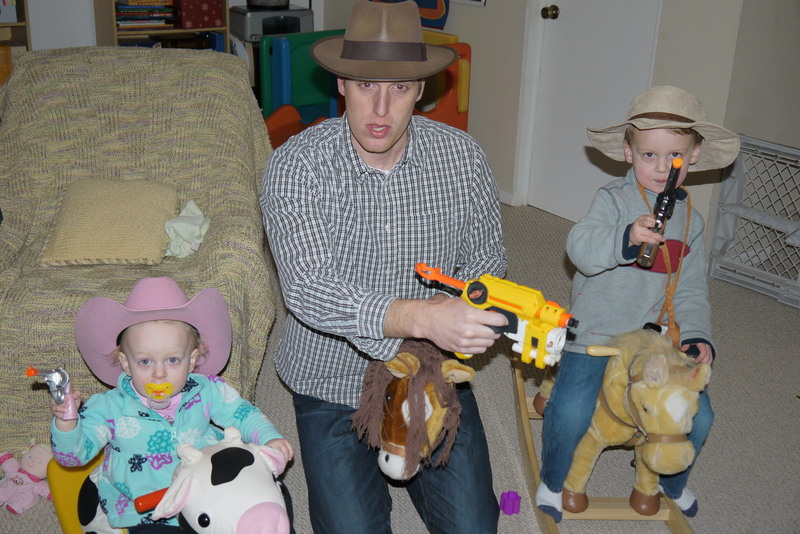 These are definitely a favorite toy of Christmas, paired with their cowboy hats, of course. 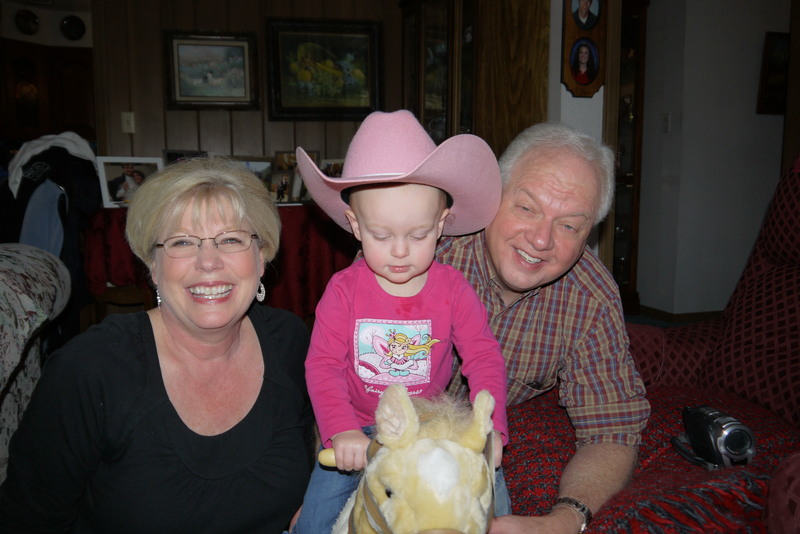 A kid can’t be a cowboy without a proper horse to ride, so Nana and Bubba provided them with the cutest rocking horse I’ve ever seen. It even makes galloping noises when you squeeze it’s ear. Christmas was great. We loved the time with family. Until next year! 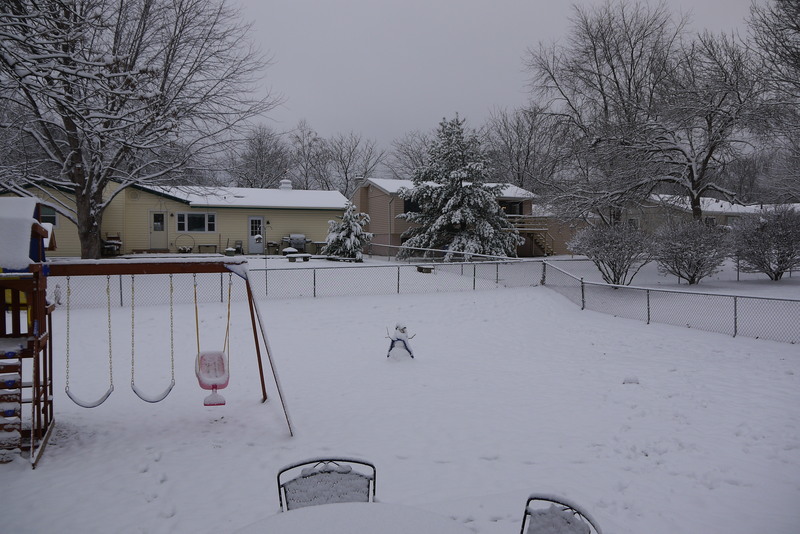 Christmas morning brought us a wintry world of white. Poor Pocky the snowman was almost unrecognizable out there. 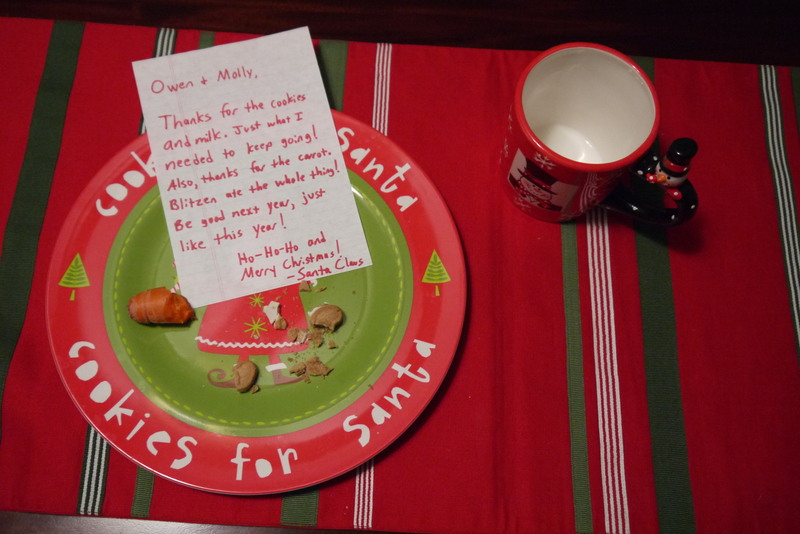 Santa had done his work the night before and had been thoughtful enough to leave the kids a note. I know that many of my friends were up with the sun (or before) because their children couldn’t wait to open their presents. 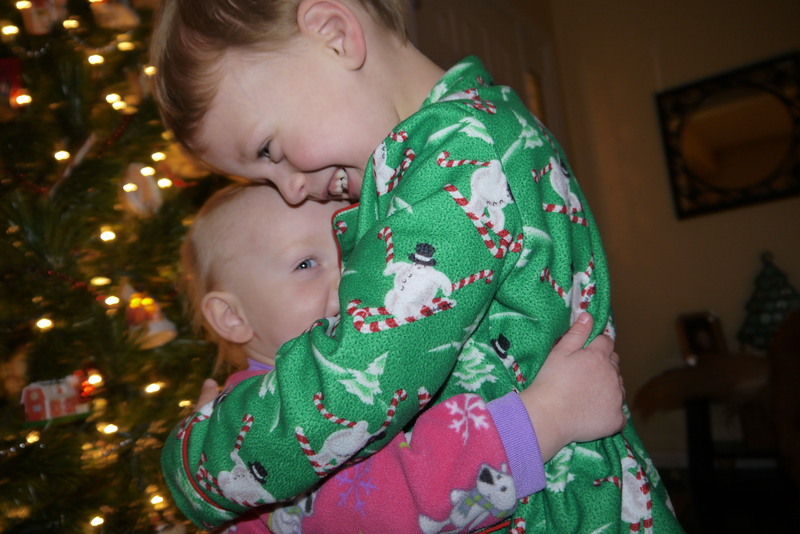 Our kids, well…don’t hate me, but they had to be woken up at 9am. Trav and I had gotten up super early to get ready and make breakfast for my parents and brother who were coming over for the morning. We had plenty of time to get everything done and then enjoyed a few minutes to sit on the couch and bask in the quiet. I’m sure this was the last year for that kind of Christmas morning peace. 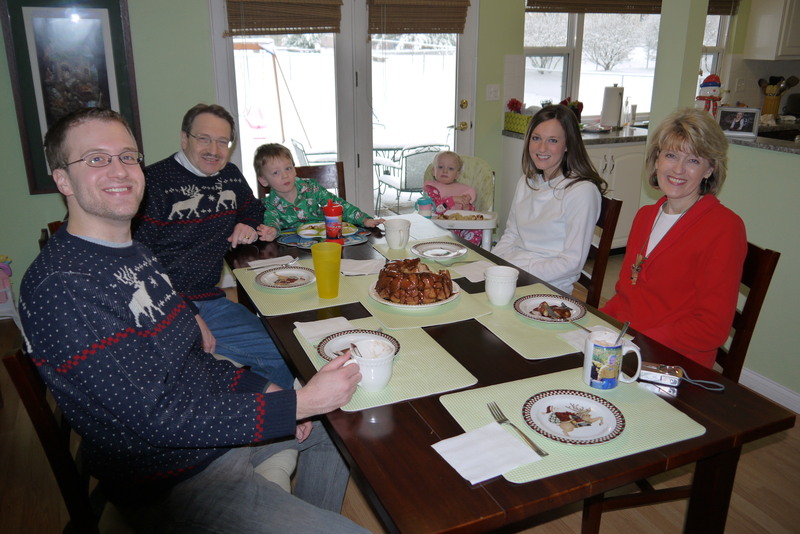 When my family arrived we chowed down on Monkey Bread. If you’ve never made Monkey Bread before, you need to. Not only is it delicious but it looks super complicated (a definite plus if you want to impress your guests 🙂 because of all the bubbles (see the picture below) but really, it’s so simple. This may become a Christmas morning tradition (even though neither of my food-hating kids would touch it…no surprise there). Yep. He was pretty pumped. 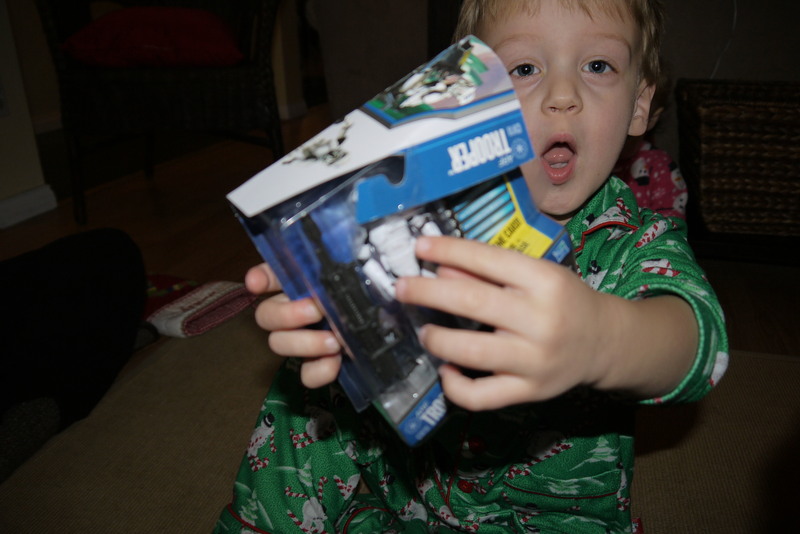 But after he opened all his presents and he only counted two storm troopers he started looking pretty down. I said, “Buddy, are you okay?”. He replied, “Well, I needed five storm troopers.” When I asked what the storm troopers were going to do he told me that they were going to stand up and have a battle. Strength in numbers, I guess. I tried to convince him that he already had two storm troopers and Santa knew that. Four storm troopers sounded like a great number to me! But five was the number in his head…and Walgreens was open on Christmas day. Little O got another storm trooper in his stocking at Mimi and Dada’s house, bringing his total to five storm troopers. The day was saved. 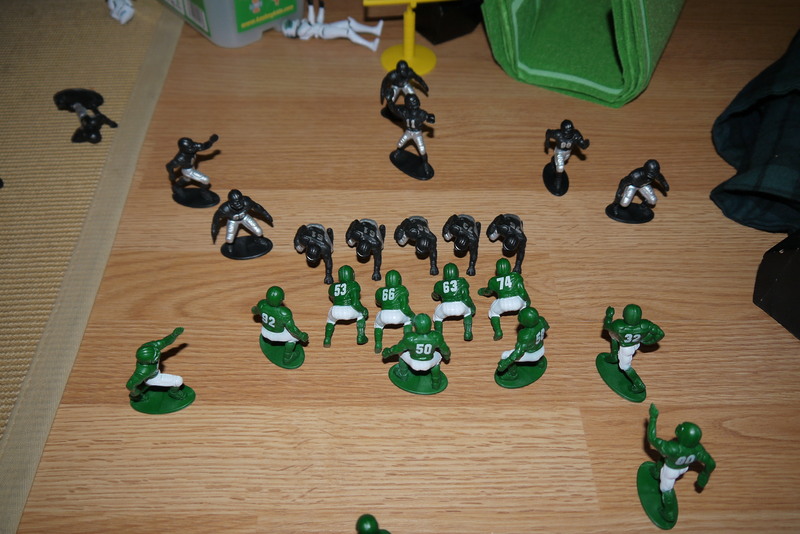 Besides getting storm troopers, Owen also got a set of football guys from Trav and me. 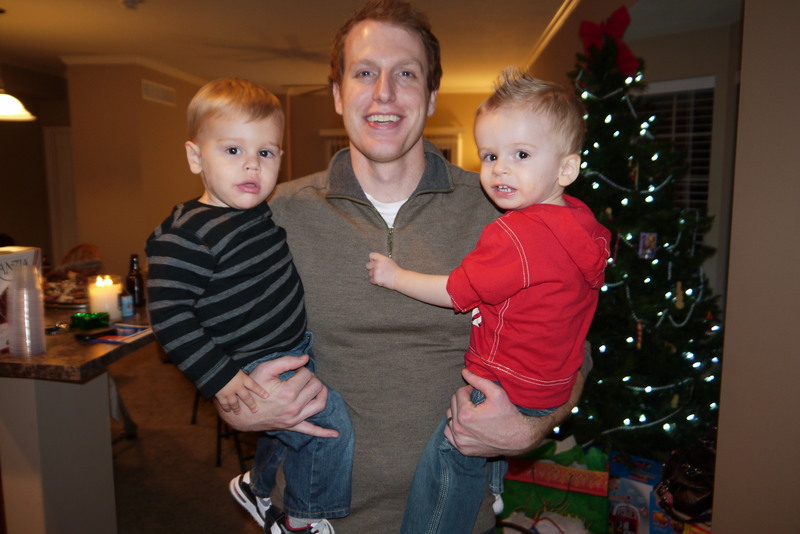 If you’ve got a little guy who’s into sports, these guys are great! Owen wasted no time in setting them up (with a little help from his dad). 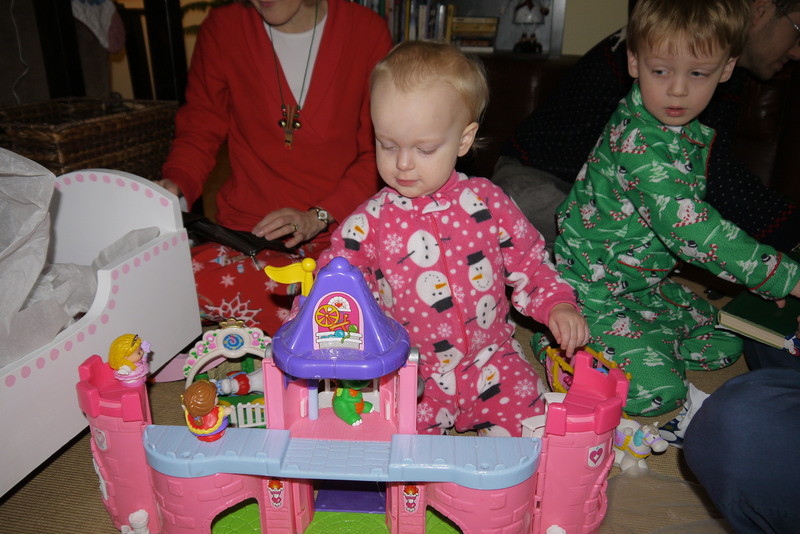 Molly’s Christmas centered around baby dolls and princesses. 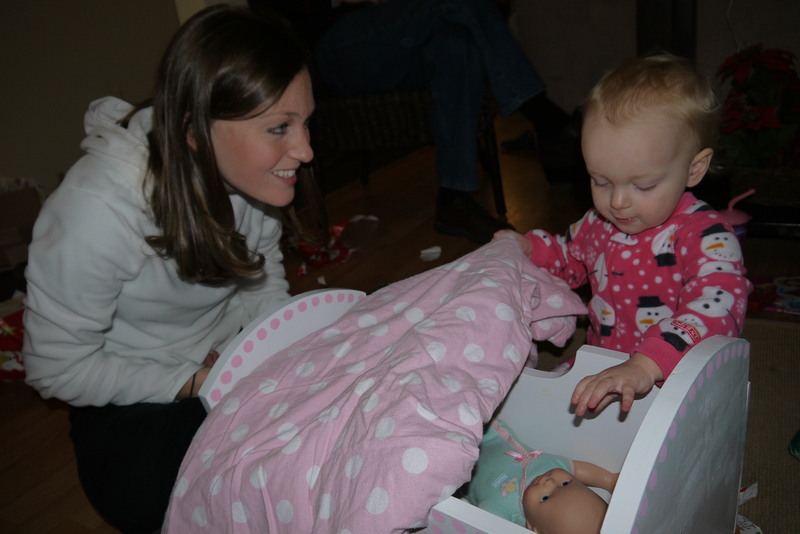 Because she is obsessed with babies (both real and dolls…but mostly real), I wanted to give her a doll cradle. I found an adorable wooden doll cradle at our church’s rummage sale when Molly was 2 months old. It was only $5 so I knew I couldn’t pass it up. I had so much fun painting it and getting it ready for Christmas morning. Molly immediately put her baby doll inside and rocked her to sleep. So sweet. After the craziness at our house, we piled in the car and headed over to my parents’ house where the fun began all over again! 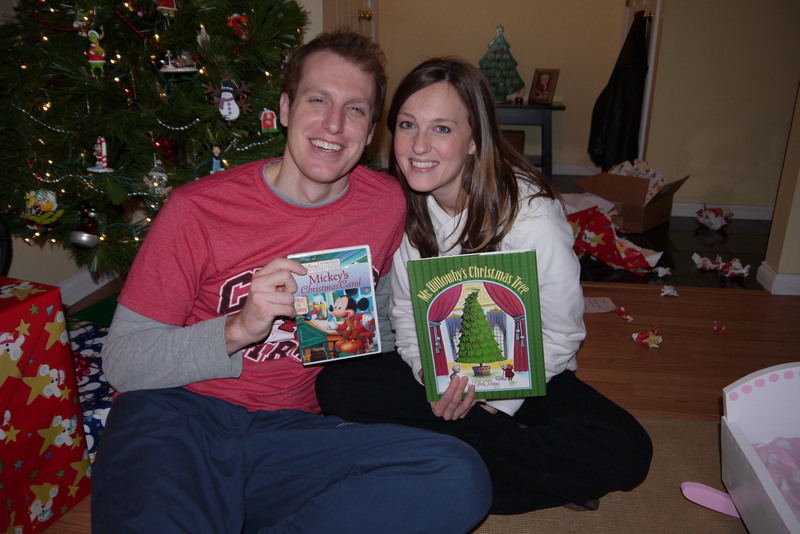 The kids couldn’t wait to dig into the presents. 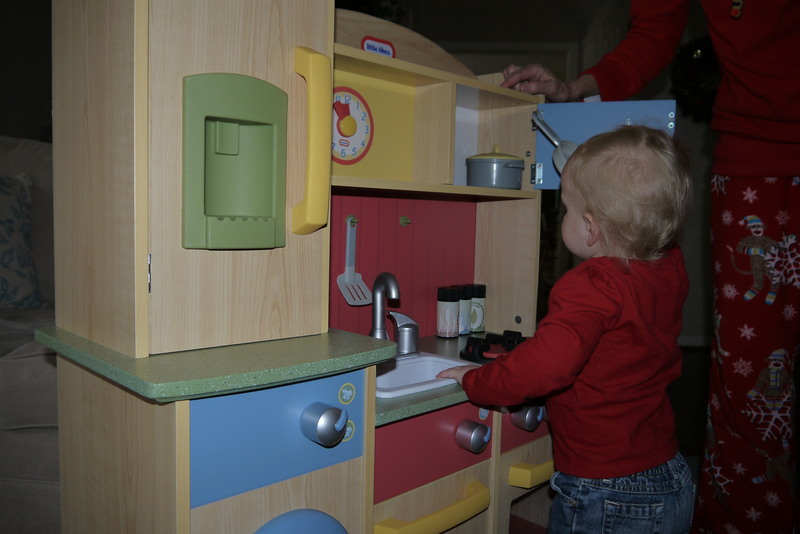 Some of the favorite presents were Molly’s new kitchen, which really has been a lot of fun for both kids. 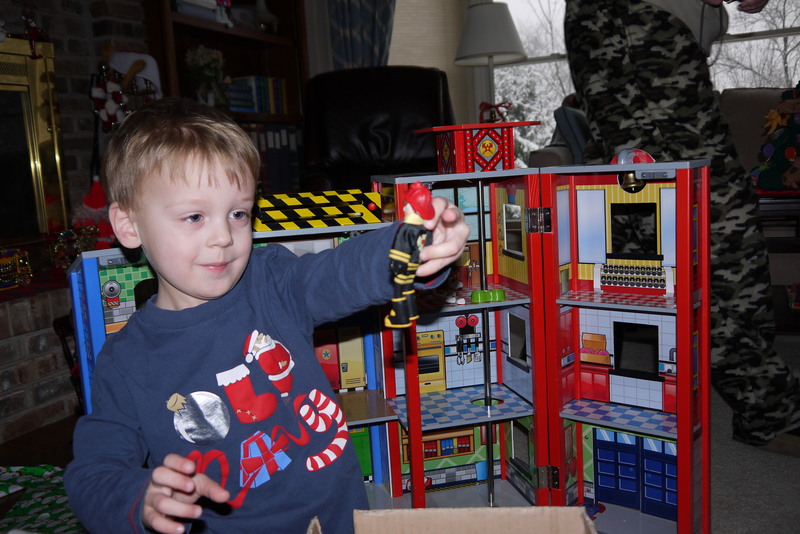 Owen was thrilled about the firehouse that he got from Mimi and Dada. 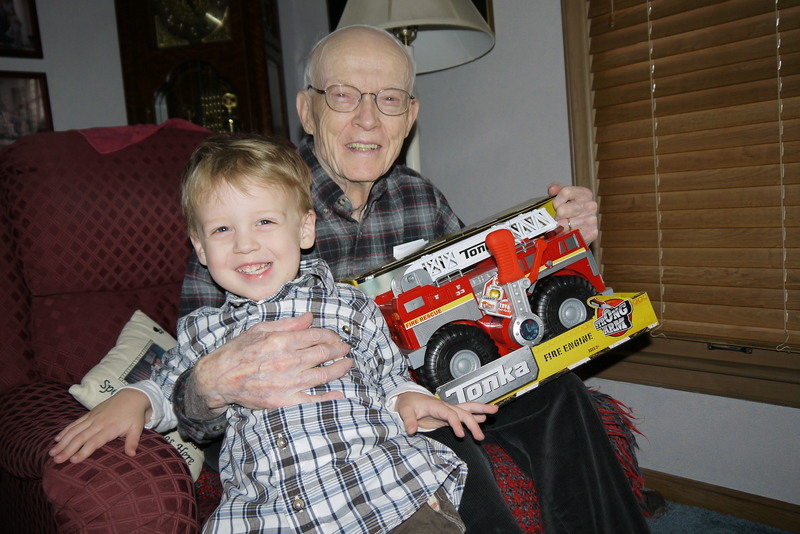 His buddy, Chase, has the same one and Owen loves to play with it whenever we go over to his house. 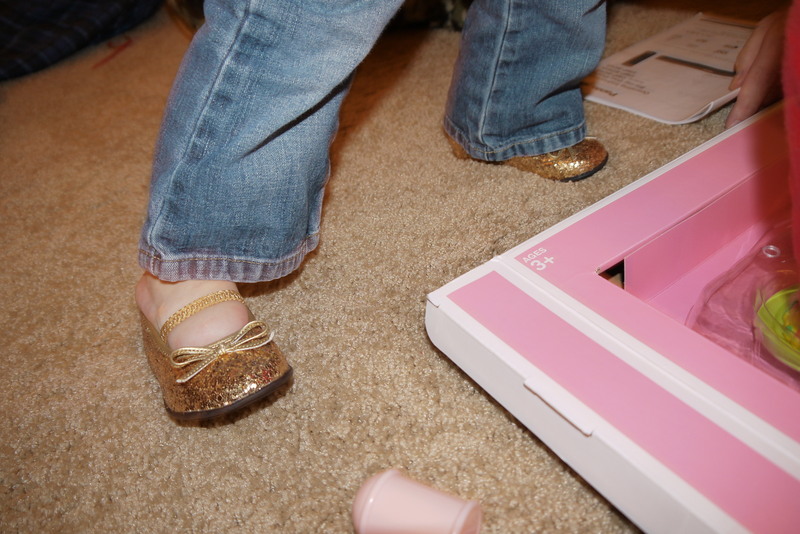 And one final hit present…Molly’s gold glitter slippers. Molly’s a shoe horse, and these beauties were just her style. Stay tuned for Christmas in Kansas City…up next.